Pictured, from left: Selectman Joseph Lovejoy, Rep. Patrick Abrami, Rep. Debra Altschiller, Position Imaging CEO Ned Hill, Japanese Consul General of New England Rokuichiro Micchi, Hitachi-LG Data Storage CEO Young Keun Park, Hitachi-LG Data Storage Vice President Hiroyuki Mizukami, and Hitachi-LG Data Storage team leader Ted Ha. Position Imaging, a Stratham-based innovator of package tracking systems, will publicly unveil for the first time its revolutionary iPickup BOPIS (Buy Online Pickup In Store) e-commerce fulfillment solution, next week, at the National Retail Federation's show in New York. iPickup streamlines in-store order pickup for customers at retail stores. The system's proprietary Amoeba computer vision technology monitors orders waiting for customer pickup without requiring lockers, robots or even store associates. The Amoeba line does not use radio frequency IDs or special labeling, but instead a computer vision system and radio-tracking line. The system alerts customers as soon as an order is ready for pickup, and customers provide a receipt or order pickup number that directs them to the item via intuitive light and audio guidance. An alarm goes off if the wrong item is taken by mistake. The company says it provides a digital breadcrumb trail of every item that goes through the in-store pickup process, reducing the risk of lost or stolen items, and making e-commerce fulfillment easier for customers. 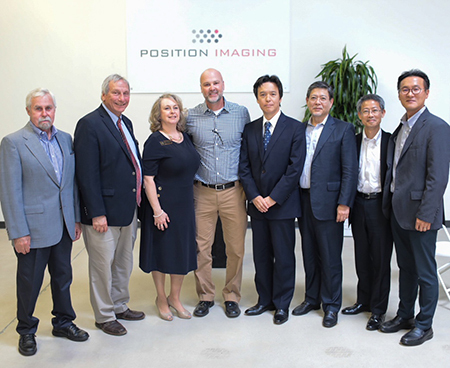 In June, Position Imaging announced it had entered into a partnership with global technology firm Hitachi-LG Data Storage, Inc. for the production of its Amoeba product line of package tracking systems. HLDS, a joint venture of Hitachi and LG Electronics based in Tokyo, specializes in optical technology and will manufacture Position Imaging’s innovative package tracking systems. The two companies have been working together to complete product designs and prepare HLDS’ manufacturing facility in Malaysia for volume production. "Our focus is to leverage our breakthrough technologies to improve customer experience," said Position Imaging CEO, Ned Hill, in a press release. "Our innovations can change the way we manage goods at retail, providing very accurate, real-time position data of products throughout the pickup process. Our system empowers all retailers, big-box and boutique, with a cost-effective, scalable, plug-and-play fulfillment solution that best meets its customer's expectations." More than 16,000 retailers and 37,000 attendees regularly attend NRF2019 Retail's Big Show.